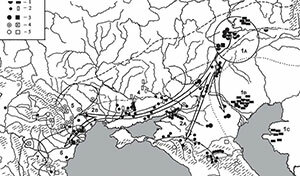 A new article by Leo S. Klejn tries to improve the Northern Mesolithic Proto-Indo-European homeland model of the Russian school of thought: The Steppe hypothesis of Indo-European origins remains to be proven, Acta Archaeologica, 88:1, 193–204. 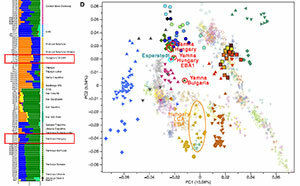 Recent genetic studies have claimed to reveal a massive migration of the bearers of the Yamnaya culture (Pit-grave culture) to the Central and Northern Europe. This migration has supposedly lead to the formation of the Corded Ware cultures and thereby to the dispersal of Indo-European languages in Europe. 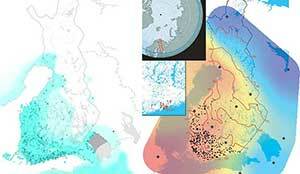 The article is a summary presentation of available archaeological, linguistic, genetic and cultural data that demonstrates many discrepancies in the suggested scenario for the transformations caused by the Yamnaya “invasion” some 5000 years ago. Both teams [Reich/Anthony, and Willerslev/Kristiansen] interpreted this resemblance in the same way: as evidence of mass migration of the Yamnaya culture from the steppes into the Central and Northern Europe, resulting in the formation of the Corded Ware cultures, and these are universally recognised as Indo-European. Since earlier in this part of Europe existed a different pool of genomes, geneticists presumed that the Yamnaya migration alone had brought the Indo-European languages into Europe. 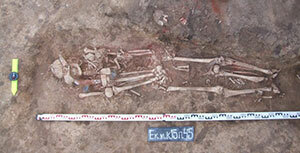 It is difficult to say to what extent the pre-convictions of the involved archaeologists influenced these conclusions, or whether the results of the genetic studies attracted archaeologists with such beliefs. 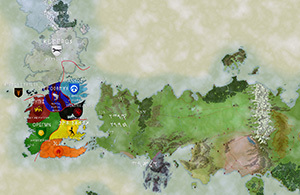 First, we might question the idea of the Yamnaya culture as a unity rather than a loose conglomerate of cultures. 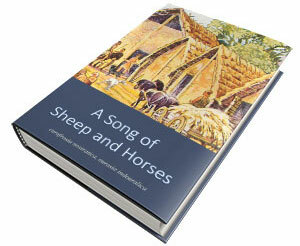 Merpert (1974) divided it into nine local groups but did not recognise them as separate cultures. However, in 1975 I suggested that Nerushay (Budzhak) monuments should be recognised as a distinct culture (Klejn 1975), although still as a part of the same broader steppe community. This was accepted by other specialists (Ivanova 2012; 2013; 2014). Generally, in the western branch of this community, a mixture of the eastern rites of interment with local, Balkan ceramics can be observed. 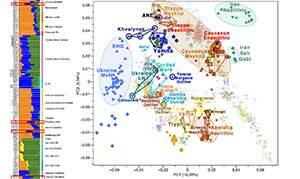 It should be noted that hitherto all genetic samples were taken from eastern material (in the vicinity of Samara in the Volga basin and Kalmykia), while the central thesis concerns the intrusion of the western branch of this community (Budzhak culture) into Europe. 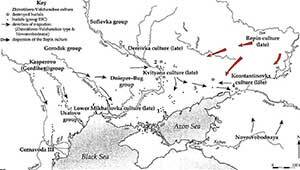 The spread of cultural-historical communities of the Yamnaya culture and the location of the Budzhak culture. GAC – Globular Amphora culture; CWC – Corded Ware culture. After Ivanova 2013. 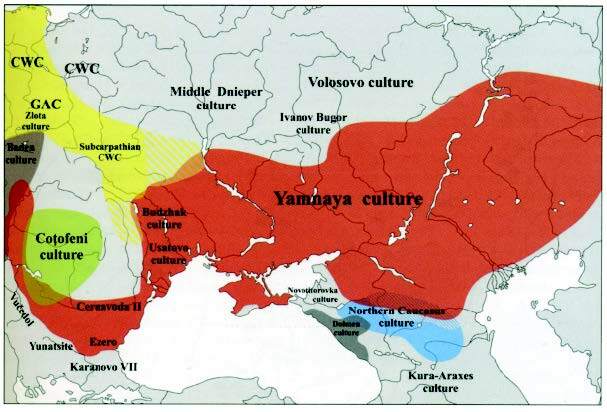 The Yamnaya culture (Chernykh & Orlovskaya 2004a; Heyd 2011; Frȋnculeasa et al. 2015) appears not to be the predecessor of the Corded Ware cultures but is contemporary with them. 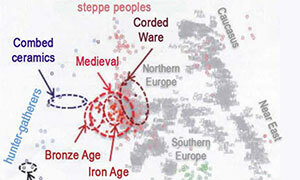 The Corded Ware cultures appeared also around the turn between the fourth and third millennium BC (Stöckli 2001; Furholt 2003). Their derivation from the Yamnaya seems, therefore, to be less probable. This is evidenced by the fact that the corded beakers or amphorae found in the Budzhak culture are not the prototypes of the corded beakers or amphorae found in more northern territories, but seem instead to be an outcome of contemporaneous contacts (Ivanova 2014; Klejn 2017c). Even more remarkable is the variation in the distribution of types of Y chromosome. In the Yamnaya population, R1b is not just a single occurrence (there are about seven known occurrences) while in the Corded Ware population a different clade of R1b is found and R1a is predominant (several instances). Thus the postulate of unbroken succession finds no support! Distribution of artefacts and customs of the Yamnaya culture in the area of the Corded Ware cultures. After Bátora 2006. In the tables presented in the article by Reichs’ team (Haak et al. 2015) the genetic pool connecting the Yamnaya culture with the Corded Ware people is shown to be more intense in Northern Europe (Norway and Sweden) and decreases gradually from the North to the South (Fig. 6). It is weakest around the Danube, in Hungary, i. e. areas neighbouring the western branch of the Yamnaya culture! This is the reverse image to what the proposed hypothesis by the geneticists would lead us to expect. It is true that this gradient is traced back from the contemporary materials, but it was already present during the Bronze Age (Klejn 2015a). The author also uses questionable interpretations from selected articles to advance his (as of today) untenable positions regarding a Mesolithic origin of the reconstructible Proto-Indo-European language. 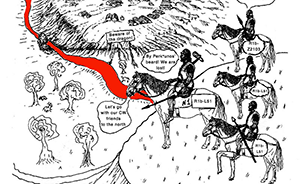 If based on the data of glottochronology (taking into account all disputes) the period of initial dispersal is to be dated to the 7th-5th millennium BC. Just yesterday I read the post The retraction paradox: Once you retract, you implicitly have to defend all the many things you haven’t yet retracted, by Andrew Gelman. While – in my opinion – the post does not live up to its title, it poses an interesting question, as to how ad logicam (fallacy fallacy) is often used today in research: One author proposes something that is later demonstrated to be wrong, so everything they wrote or write can be said ipso facto to be wrong…especially if they accept that it was wrong. This is usual with amateur geneticists (those who don’t publish, and are therefore not subjected to criticism): if anyone is wrong (whether in Archaeology or Genetics), then they are wrong in everything else. It seems to me that Klejn’s theses against recent genetic results rest on the same assumption: The Yamna -> Corded Ware migration model is wrong, ergo the Yamna homeland model is wrong. I guess this same fallacy is what a lot of angered geneticists (whether professional or amateurs) are going to use to dismiss Klejn’s criticism, trying to focus on what he clearly does not grasp – about genomic data of Yamna peoples and their expansion – to disregard his doubts on genetic interpretations entirely. Those who dismiss this warning lightly seem to forget the fate of other recent “scientific breakthroughs” which were initially so promising that Humanities appeared to matter no more, like glottochronology for Linguistics and, to some extent, that of radiocarbon analysis for Archaeology. Featured image: The direction of the supposed migration of the bearers of the Yamnaya culture into the area of the Corded Ware cultures. After Haak et al. 2015. 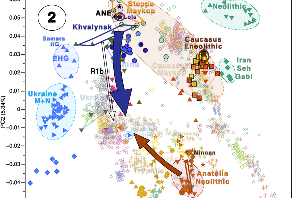 NOTE: I obviously don’t agree with Klejn’s main model: he criticises the Proto-Indo-European steppe homeland, and more specifically the expansion of Yamna peoples with R1b-L23 subclades, which I support. But, probably because of his “pre-convictions” (as he puts it when describing proponents of the steppe hypotheses) about the Proto-Indo-European homeland in Northern Europe during the Mesolithic, he was one of the first renown archaeologists to criticise the obvious inconsistencies in the genetic model of migrations based exclusively on the “Yamnaya ancestral component” concept, and to provoke the necessary reaction from (until then) overconfident geneticists, and he deserves credit for that. In my opinion, the Russian school’s “Northern European Mesolithic” homeland model – as I have said before – could be based on the appearance of EHG ancestry, or maybe on the expansion of haplogroup R1b with post-Swiderian cultures, but the timeframe proposed is too early for any reconstructible parent proto-language, even for Indo-Uralic.